The old castle/fortress of Paliokastro was built by the Franks around 1278 / 13th (it seems position built on the ruins of a ancient Acropolis from the Pylos-Koryphasion city of Classical period), is situated the north side of Navarino bay, on the top of the hill (this promontory called Koryphasion -or Coryphasion-). The castle is ruin, but the outside walls and his round and square towers is saved in a good condition. Paliokastro castle lost his importance when in 1573 the Turks built a new fortress (Neokastro) at the southern entrance of the Navarino bay. Below the castle, in the cliff just above Voidokilia, you find a cave referred to as Nestor’s cave by ancient Greek traveller Pausanias; according to Greek mythology, it was there that Hermes hid the cattle he had stolen from his brother, Apollo; However, the latter found out and as a penance Hermes offered him a lyre made of tortoise shell. 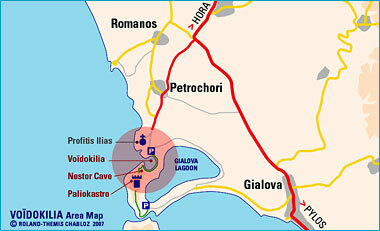 - To the north: you see Voidokilia Bay and Romanou-Petrochori beaches in the distance. - To the east: the Gialova Divari lagoon, the Peloponnesian hills covered with olive trees. - In the south: the Sykias chanel, the Sphacteria island, the Navarino bay and the city of Pylos. - To the west: the vast Ionian Sea. 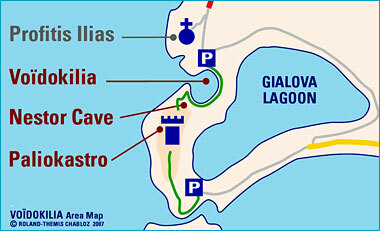 • By car: from Gialova, take the road along the golden beach and the lagoon, when the road in a gravel path that finish in dead-end; there, you can park your vehicle (facing the northern tip of Sphacteria island - next to the Sykias Chanel). Then, a path allows the ascension of the promontory to enter the castle. 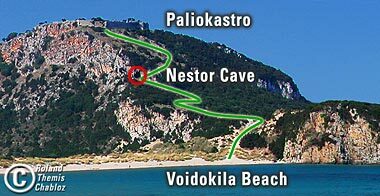 • Hiking/footpath: at the end of Voidokilia beach, begin your climb up the hill. The path leads passes through the Nestor's cave. Beware of vegetation and shrubs! To enjoy this hike it's recommended to wear long trousers and closed shoes for the climb.